Public debates regarding the relations between Cuba and the international financial institutions (IFIs) have been laced with serious misconceptions. Contrary to common belief, the United States does not hold veto power over IFI voting procedures on new memberships. And while it may have been true in the past that Cuba was disinterested, this article presents fresh evidence that today, Cuba may be prepared to re-engage with the IFIs (pre-revolutionary Cuba was a member of the IMF and World Bank). Often, it is assumed that the IFIs cannot engage with non-members. In fact, there are numerous precedents for extending technical assistance and even financial resources to non-member states and entities, for example through the establishment of trust funds administered and financed by third parties. As this paper will argue, in the case of Cuba a gradual stepby- step process of confidence-building, through various channels of technical assistance, is feasible and would be most responsive to various political sensitivities. Also contrary to conventional wisdom, Cuba’s nonparticipation in the Organization of American States (OAS) is not a legal obstacle to membership in the Inter-American Development Bank (IDB). Nor is U.S. voting power in the IDB sufficient to defeat a vote on new members. Furthermore, this section will explore another potential option, generally overlooked, for multilateral assistance to Cuba: the Andean Development Corporation (CAF), of which the U.S. is not a member. What, then, accounts for the anomaly of the empty Cuban seat at these international organizations? The principal answer is as simple as it is disturbing: a relatively small but well placed and hard-charging community of Cuban-American exiles. As will be explained toward the end of this section, U.S. legislation mandates the U.S. Executive Director in the IFIs to oppose the admission of Cuba, and to withhold U.S. payments to the IFIs should they approve assistance to Cuba over U.S. opposition. Moreover, influential congressional representatives stand ready to hold legislation or personnel confirmations of interest to the executive branch hostage to their Cuba-related concerns. To a remarkable degree, the unyielding Cuban-American lobby has bullied the U.S. executive branch and the IFI leadership into submission, even as many of their economists and staff understand that excluding Cuba—or any country, for that matter—on political grounds runs counter to U.S. strategic interests and core IFI norms. In U.S. debates on Cuba policy, there is no equally insistent counter-lobby to balance the hardline pro-sanctions faction. Within these political realities, this section argues that there are still viable mechanisms, with well-established precedents, for a gradual rapprochement between the IFIs and Cuba. But Cuba ought not to anticipate a sudden gush of official capital; rather, the IFIs will want to begin with technical assistance (policy dialogue and training), to build mutual confidence and to gain a fuller understanding of the Cuban economy and the interests and intentions of Cuban policy makers. After years of isolation and ideological suspicions, Cuba, too, will most probably prefer a go-slow relationship. The core international financial institutions—the International Monetary Fund and the World Bank—are universal institutions. Their membership of 187 countries, encompassing the planet’s full diversity of political and economic systems, is virtually equivalent to that of the United Nations: aside from a few mini-states (Andorra, Monaco, Liechtenstein, Nauru), the only other UN members that are not members of the IMF and World Bank are the Democratic People’s Republic of Korea and Cuba. Most likely, North Korea may one day be re-unified with South Korea and hence will be absorbed into a state that is already a member of the IMF and World Bank. Thus, Cuba’s non-membership in the IFIs stands out as a starkly unique case. Over the years, the IMF has admitted many new members whose statist economic policies diverged greatly from free-market norms. For example, in the 1990s, the IMF admitted nations from Central Asia, former members of the Soviet Union, which had retained many characteristics of the old Soviet system of central planning. As an institution, the IMF has views on what constitute sound economic policies (even as these views have evolved considerably over time), but does not require that new applicants conform to these views as a condition of admission. Rather, the IMF can be likened to the patient parent, happy to accept new members within the household and tolerant of errant conduct while hoping to gradually persuade the new charges to adopt more sensible behavior—behavior that is judged to be in their own long-term interests. As an amendment to the Articles in 1978, the second sentence in Article II, section 2 was added,7 “the principles consistent with those applied to other countries that are already members.” Hence, the Articles are now more explicit in tilting in the direction of acting favorably on new applications by interested states. Now more than ever, the “principles applied to countries that are already members” direct the Fund to show great readiness in responding to new applications for membership. Indicative of the IMF’s drive toward universal membership, it accepted the application of the South Pacific island-state, Tuvalu, in 2010. With a population of less than 11,000, on a per capita basis, Tuvalu will be administratively costly for the IMF.8 Nevertheless, the predisposition to accede to requests for membership prevailed. (a) Any country may apply for membership in the Fund by filing with the Fund an application, which shall set forth all relevant facts. (b) The Executive Board shall report on all applications to the Board of Governors. When an application is submitted to the Board of Governors with a recommendation that the applicant country be admitted to membership, the Executive Board after consultation with the applicant country shall recommend to the Board of Governors the amount of the quota, the form of payment of the subscription, and such other conditions as, in the opinion of the Executive Board, the Board of Governors may wish to prescribe. Based on the author’s discussions with IMF staff familiar with the membership process, the IMF maintains a strong interest in the exhortation made in the Articles under “General Obligations of Members” (Article IV, section 1), that calls upon each member to “undertake to collaborate with the Fund.” The original language refers to collaboration “to assure orderly exchange rates,” which has lost its original meaning in a world that abandoned the earlier Bretton Woods system of fixed exchange rates, and is now interpreted, in part, to refer to the sharing of information and data on a member’s national economy with IMF staff. For without basic information, how can IMF staff even begin to perform their duties of analyzing a member’s economy and providing appropriate advice? Yet even here, some governments are more responsive to these “obligations” than are others. Some Fund members are less than forthcoming, and many others simply lack the administrative capacity to collect and format basic economic statistics. Again, IMF staff can be tolerant, merely asking that members show good faith and willingness to consult, in the expectation that, with IMF assistance, a member’s national accounts will improve over time. Of course, if a member seeks to borrow IMF resources and thereby place the institution’s resources at risk, data requirements become stricter. Contrary to common opinion, neither the IMF’s Articles nor By-laws require a consensus, or a super-majority vote, in taking decisions on applications for membership. On the contrary, a simple majority of (weighted) votes is sufficient. With regard to voting procedures in general, the IMF by-laws specify: “Except as otherwise specifically provided in the Articles of Agreement, all decisions of the Board of Governors shall be made by a majority of the votes cast. At any meeting the Chairman may ascertain the sense of the meeting in lieu of a formal vote but he shall require a formal vote upon the request of any Governor” (section 11). And nowhere do the Articles or the By-laws call for a super majority for membership. Notably, the UN sets a higher procedural bar for membership. First, as stated explicitly in the UN Charter, an application for membership must receive the votes of at least 60% of the 15–member Security Council, and encountering no negative votes by the five permanent members. Then the application must receive a two-thirds majority vote in the General Assembly. (Cuba was a founding member of the UN and North Korea was admitted in 1991.) Thus, the United Nations, itself seeking universal membership, has more demanding voting procedures than the world’s central monetary fund. The intent of the amended Articles is clear: the IMF membership prefer that a member state remain within the fold where, over time, it is more likely that its behavior will come into compliance with its “obligations.” Indeed, no member has been expelled in recent decades, despite egregious behavior by a number of member states, including prolonged failure to repay loans, failure to provide timely and truthful data, and failure to cooperate and communicate in a timely way. While historical counter-factuals are inevitably hazardous, it seems unlikely, had the current rules and customs been in operation in 1964, that Cuba would have been pressured to withdraw. The IMF Executive Directors had approved the text of a letter, which was sent by the Managing Director to Cuba inquiring about its intentions, but no reply was received to this letter or to subsequent letters. The Executive Directors were to meet on April 15, 1964, to consider whether Cuba should be declared ineligible (to access Fund resources) under Article XV, Section 2. On April 3, 1964 Cuba pre-empted the board meeting and notified the IMF of its withdrawal from membership, which was effective immediately. The Cuban pre-emption absolved the IMF from further action. However, had Cuba been declared ineligible to use IMF resources and had continued to fail to fulfill its obligations, the then Board of Governors of that era would most likely have declared Cuba expelled—but it never came to that. At the closing of the 2009 spring annual meetings of the Bretton Woods agencies, IMF spokesperson David Hawley was asked for his reaction to the suggestion by the Brazilian finance minister that Cuba be admitted to the IMF. Hawley responded: “I am not aware that Cuba has applied for membership of the IMF. Any country may apply for membership.” Hawley was correct in that, to initiate the formal membership process, the suitor must take the first step. Cuba has not done so. When asked by the author for the Cuban position regarding IMF membership, a senior official of the Cuban Ministry of Foreign Affairs responded: “Cuba has no principled position against relations with the IMF or World Bank.”13 To the author’s knowledge, this is the first such official Cuban statement suggesting openness to engaging with the Bretton Woods agencies. The use of the term “principled position” is especially meaningful in the Cuban context, as Cuban officials frequently cite the importance of acting in ways that are consistent with “revolutionary principles.” Unlike in U.S. parlance, where “in principle” can mean ethically sound but not practical, in the Cuban official idiom affirming that a statement is a “principled position” amounts to a straightforward endorsement. The senior Cuban diplomat went further and noted that Cuba can be a member of an international organization without necessarily agreeing with all of its activities, as is the case with Cuban membership in the United Nations. (As a founding member in 1948 of the Geneva-based General Agreement on Tariffs and Trade, Cuba is also a member of the successor World Trade Organization, where it questions whether U.S. trade sanctions against Cuba violate WTO norms.) The Cuban diplomat went on to remark that the World Bank, with its broad international experiences, might be better able to assess the Cuban experience than would be individual governments that inevitably see things through their own experiences. The Cuban diplomat had been impressed by a World Bank official he had met with broad experience in Syria, Tunisia, and Iran, as well as throughout the Caribbean. Among Fund staff, the author has found a general willingness—even eagerness, especially among economists from Latin America—to entertain a Cuban expression of interest in technical assistance and eventual membership. Indeed, it is generally noted that Cuban non-membership is a glaring exception to the otherwise universality of membership. Except, that is, among those individuals working in the IMF who are particularly sensitive to U.S. domestic politics, among whom the mere mention of “Cuba,” in an official, on-the-record setting, injects an instantaneous chill in the conversation. (Privately, some of these same individuals express regret at the extraordinarily prolonged exclusion of Cuba from the IFIs.) U.S. attitudes weigh heavily because while legally only a majority of (weighted) votes is required for IMF membership, in practice the Fund’s executive board hesitates to act counter to strong objections by its major shareholder (more on this later). Cuban economic activity has spillover effects on other economies in the Caribbean region that are members; one obvious example is Cuban tourism, in fact the subject of an article published in 2010 by IMF staff.15 As part of the IMF’s responsibilities for regional surveillance, awareness of the Cuban economy is part of the broader equation. Cuba’s trade, investment, exchange-rate, and external debt policies—the bread-and-butter issues of the IMF—are of considerable interest to other member states and their business enterprises engaged with the Cuban economy, including both the traditional European powers and the emerging market economies. At some point, Cuba will cease to be the lone outlier and will rejoin the Bretton Woods agencies, and staff should be adequately prepared, ready to describe the economy as it is and to prescribe policy options for consideration by Cuban authorities and the IFI’s managements and executive boards. Internal analyses found that one reason the IFIs did not perform optimally in Russia in the early 1990s was their admitted failure to have staffed up on time. The Fund and Bank should not make the same serious mistake with Cuba. The current casual watching briefs fall well short of the in-depth professional knowledge that the institutions will need when the day finally arrives. It may be premature to talk about full-on Cuban membership in the IFIs. It is overdue, however, to discuss other forms of engagement. History suggests that prior to membership, the IMF may extend technical assistance to interested non-members. In some cases, the World Bank has also been able to extend not only technical assistance but also financial collaboration. As Cuba enters its arduous process of economic reform, it could benefit tremendously from the accumulated expertise housed in the international financial institutions. On a wide range of tough issues facing Cuban policymakers, the IMF and World Bank can bring to bear knowledge of past experiences from around the globe as well as their capacity to analyze specific country circumstances in the context of today’s global economy. True, Cuba can turn to individual governments, private consulting firms, and academic economists for advice, and their voices can be valuable additives to enrich policy debates, but none can match the scope and depth of IFI expertise. 17 The IFIs are also well equipped to provide the large-scale training and capacity-building that Cuba sorely requires. It is not a matter of mechanically applying the Chinese, Vietnamese, Singaporean, South Korean, Brazilian, Chilean or other “models” to Cuba. It is well understood within the economics profession and the IFIs that whatever “lessons” can be culled from history must be carefully adjusted to the peculiar conditions of each country. Every nation has its own history, culture, location, comparative advantages, and governance structures. For example, Cuba has developed its human capital, through superior education and health programs, gaining its own dynamic comparative advantages such that it is exporting the services of large numbers of skilled professionals. At the same time, debates on the island sometimes exaggerate “Cuban exceptionalism,” as though certain widely observed economic rules and relationships do not apply and Cuba has nothing to learn from the rest of the world.18 Neither a cookie-cutter one-size-fits-all imposition of a foreign model, nor a blind refusal to learn from the successes and failures of other countries, makes good sense. There are plentiful precedents of the IMF providing technical assistance to non-member states and territories. Recent cases include South Sudan, Kosovo, and West Bank/Gaza, and in earlier decades, the former Soviet Union and its Eastern European allies.19 Often but not always such assistance has been linked to expectations of future membership. Because IMF policy is to provide technical assistance but not financial resources to non-members, to cover staff and administer costs the Fund sometimes establishes trust funds, financed by third parties and at times managed by another international entity. Interestingly, IDA’s Articles of Agreement (Article V, section iic) allow for the provision of IDA resources not only to members but also “to a public international or regional organization.” On this authority, IDA provided financial resources to the UN Mission in Kosovo (UNMIK), itself a part of the UN system and hence a public international organization.25 However, the World Bank may determine, eventually, that Cuba’s per capita income is too high for it to qualify for IDA’s highly concessionary resources. Before Angola joined the IFIs in 1989, it received some informal technical assistance from the IMF and the World Bank produced a country economic report with financing through the UN Development Program (UNDP). At the time, the United States was opposing IFI engagement with Angola, so the Bank was careful to use external consultants for incountry work. Bank lawyers justify expenditure of Bank resources on non-members with reference to Article III, Section 1 (a) of the Bank’s Articles of Agreement: “The resources and facilities of the Bank should be used exclusively for the benefit of members….” The Bank can decide, the Bank’s General Counsel has argued, that an activity is for the benefit not only of the country or territory in question but also “for the benefit” of the Bank and the members as a whole.26 This legal interpretation provides wide leeway in the treatment of non-members. After years of imagining that the IFIs were instruments of the “historic enemy” (i.e., the United States) and the stronghold of pernicious imperialist ideologies, Cuba—both government and people— are not prepared for a sudden embrace. Rather, a gradual process of confidence-building will be required. Once sufficient mutual trust has been established, IFI staff could undertake studies in their core areas of expertise, including the more controversial strategic areas of macroeconomic and monetary policies, again incorporating Cuban experts in related research. A comprehensive joint IMF-World Bank country strategy paper could follow, presenting proposals and options for the sequencing of reforms. The strategy paper might be composed within a broad-based process of consultations with Cuban stakeholders; a prominent role in this participatory process and in the elaboration of the report might be assigned to Cuban officials and economists. A jointly elaborated plan for the financing of reforms, including the division of labor among international donors, would be another critical step in propelling reform forward. In considering external sources of funds and expertise, the helping hand of the Cuban Diaspora, in the United States but also in Canada, Europe, and Latin America, should be given full play. To cover the costs of IFI technical assistance to a non-member, a trust fund with third-party financing could be established. The UNDP, already well-established in Cuba, could play a central role, as it has done elsewhere. By responding to such a list, the IFIs could begin a constructive, step-by-step dialogue with leading Cuban economists and policymakers. In a preliminary reaction, World Bank economists familiar with the Cuban economy agreed that these were all important topics. Located in Barbados and Guatemala, these technical assistance centers could be ideal cost-effective and politically neutral venues for offering seminars and workshops to Cubans, avoiding at the outset a visible IMF presence in Havana or a potentially controversial Cuban presence in Washington, DC. Such events could either be exclusive to Cubans or, more discreetly, could be scheduled for regional members while allowing Cuban participation. In the Cuban case, a separate trust fund might be established for the training of Cuban nationals. Training for new private-sector entrepreneurs empowered by Cuba’s economic reforms will also be high on any agenda but this is more the expertise of bilateral donors, non-governmental organizations, and international business schools than of the IMF or IBRD. Further down the road, Cuba could call upon the International Finance Corporation (IFC) of the World Bank and the private-sector arm of the IDB where relevant expertise lies. The IDB Charter contains one other stipulation for membership that has been a cause of some confusion in the Cuba case. “Membership shall be open to other members of the Organization of American States….” (Article II, Section 1(b)). In 1962 the OAS voted “to exclude the Government of Cuba from its participation in the inter-American system.” 30 The operative word here is participation. The government of Cuba was never expelled from the OAS. In the realm of international organizations, there is an established sequence for dealing with errant states: (1) ineligibility for certain programs or funds; (2) exclusion from participation and voting; (3) finally and as a last resort, expulsion. In 1962, the OAS reached for stage two but not stage three. It is worth noting that some major Latin American countries objected to the 1962 resolution, as advanced by the United States, and presumably would have opposed even more strenuously a resolution calling for the ultimate sanction of expulsion. The IDB would defer to the OAS as to whether a state is an OAS member. In the case of Cuba, the OAS recognizes that there is no question but that Cuba has never ceased to be a member: the wording of the 1962 resolution is clear and simple, the government of Cuba was excluded from participation, and Cuba was not expelled from the institution. Hence, Cuba remains on the official OAS letterhead. The Cuban flag is routinely displayed along with the flags of other OAS member states at official OAS gatherings. The OAS continued to employ Cuban nationals into the 1980s, and the OAS can only employ nationals of member states. Questions remain as to the conditions that will apply to allowing the “full participation” of Cuba in the OAS. The 2009 resolution stated that “the participation of the Republic of Cuba in the OAS will be the result of a process of dialogue initiated at the request of the Government of Cuba, and in accordance with the practices, purposes, and principles of the OAS.” Exactly what this might imply with regard to Cuba’s adherence to the principles of the 2001 Inter-American Democratic Charter and other democracy-related provisions of OAS decisions remains an issue for future diplomacy. To date, Cuba has displayed no interest in initiating such a dialogue. But this standoff is not germane to Cuba’s potential membership in the Inter-American Development Bank. The IDB Charter contains no qualifying adjectives, such as “participating” or “democratic” in its membership stipulation. It merely requires membership in the OAS, a status which Cuba already enjoys. Established in 1970 by five Andean nations, the Andean Development Corporation (Corporación Andina de Fomento, known by its Spanish acronym CAF) has expanded to include 18 member countries including two from the Caribbean (Jamaica and the Dominican Republic) and Spain and Portugal. CAF’s membership does not include the United States. The headquarters is located in Caracas, Venezuela. Since 1991 CAF has been led by President Enrique García, a Bolivian national and a statesman widely respected for his diplomatic skills and political independence. CAF has grown into a respected and increasingly active multilateral financial institution. In 2010 CAF approved a record $10.6 billion in loans and investments and disbursed $7.6 billion.32 The total outstanding portfolio had reached $13.8 billion. In 2009 its membership approved a doubling of paid-in capital, giving CAF the capacities to contribute significantly to regional development in the years ahead. Unlike the World Bank, CAF is not divided into donors and recipients. Rather, all members contribute as shareholders and all are eligible to benefit from CAF activities. In current parlance, CAF is a premier example of South-South cooperation, an unusually institutionalized manifestation with a business model that has proven to be both politically and financially sustainable. CAF concentrates on lending to sovereign entities but also provides loans and investments to publicprivate partnerships and to financial institutions and private firms. CAF activities span a wide variety of development sectors, specializing in infrastructure projects (transportation, energy, communications) that promote regional integration, but also supporting social development and inclusion, export promotion and national competitiveness, capital markets, and small and medium-sized enterprises and microfinance. In the governance realm, CAF supports political decentralization through capacity-building at the municipal level. A relatively cautious multilateral agency with an excellent repayment record, CAF accesses international capital markets with an “A” credit rating. Cooperation funds are primarily intended to support reforms related to state modernization processes, such as privatization, administrative decentralization and institutional strengthening. They also contribute to export and investment plans, the development and integration of the region’s financial and capital markets, technology transfer and adaptation, environmental protection, social development and the promotion of cultural values. Might CAF establish such a specialized cooperation fund—whether with its own resources, the resources of other countries or entities, or some combination thereof—to engage Cuba, beginning with technical assistance and training and, if progress were made, possibly expanding to project loans and investments? Such activities could be framed as helping to prepare Cuba for eventual membership in CAF. One would imagine that influential CAF shareholders (including Venezuela, Brazil, and Argentina) would be supportive, and would agree that the goals of such a Cuba fund could be made consistent with overall CAF policies. Host Venezuela would presumably be particularly amenable. An informal conversation by the author with a senior CAF official revealed an interest in broaching the idea with the Cuban government. In CAF’s assistance to Haiti, there is a precedent for providing resources to a non-member nation. The U.S. Congress, nevertheless, has passed legislation that conditions U.S. policies toward Cuban admission to, and receipt of resources from, the IFIs. These bills include the Cuban Liberty and Democratic Solidarity Act of 1996 (“Helms-Burton”) and legislation concerning international terrorism, expropriation, and trafficking in persons. The most prominent of these legislative mandates, Helms-Burton, instructs the U.S. Executive Directors in the IFIs “to oppose the admission of Cuba as a member of such institution until the President submits a determination that a democratically elected government in Cuba is in power” (Public Law 104– 114 (1996), Section 104). The bill continues: “If any international financial institution approves a loan or other assistance to the Cuban government over the opposition of the United States, then the Secretary of the Treasury shall withhold from payment to such institution an amount equal to the amount of the loan or other assistance” with respect to either the paid-in or callable portion of the increase in the institution’s capital stock. Historically, the U.S. Treasury has firmly opposed such country-specific restrictions on U.S. contributions to the IFIs, as limiting U.S. flexibility and as contrary to U.S. obligations under the IFI charters. In the 1970s, when some members of Congress had similarly sought to condition U.S. payments to the IFIs, the Treasury successfully persuaded the legislature to drop the initiative. In addition to running counter to U.S. obligations under the Articles, such provisions would have been difficult to implement in practice, and could well have been rejected by the IFIs themselves. If the sanctions were interpreted to apply to previous U.S. contributions, it is unclear how the U.S. could claw back resources. If the legislation were applied to new U.S. contributions, then after the U.S. carried out the sanctions, the United States would fall into arrears on its obligations— which would immediately pose problems for the U.S. position within the IFIs and, as the U.S. is the major shareholder, for the IFIs themselves. Again in 1995–96, when a draft of Helms-Burton was being debated in the Congress, the executive branch expressed its opposition to many of its clauses, including those pertaining to the IFIs (the author was serving on the National Security Council at the time). But when the Cuban air force shot down two civilian aircraft piloted by Cuban-Americans, on the grounds—disputed by the United States and others—that the planes were violating Cuban air space, congressional opinion flowed overwhelmingly in favor of the anti-Cuban legislation and President Bill Clinton, anticipating a congressional override, signed the legislation. In response to an accumulation of congressional mandates, the Treasury feels bound to instruct its Executive Directors to use their “voice and vote” to promote a wide range of goals, on issues ranging from trade in palm oil and citrus, the environment and workers’ rights, to anti-corruption and the needs of the poor, to nuclear weapons proliferation and anti-terrorism. Treasury considers that continued congressional support for U.S. participation in the IFIs and for their periodic financial replenishments is dependent upon how well Treasury implements these mandates. Interestingly, Helms-Burton requires the U.S. to oppose the admission of Cuba and to punish the IFIs if they approve loans to Cuba—but it does not explicitly require the U.S. to vote against loans or other assistance to Cuba. One might suppose that this was the intent of the drafters of the legislation, but it is an odd omission in light of the clear voting requirements on loans in other IFI-related legislation. Further, Helms-Burton speaks of “assistance to the Cuban Government.” It does not directly address IFI assistance to non-governmental entities or private enterprises within Cuba, or to regional and international institutions or trust funds. As discussed earlier, the IFIs have developed mechanisms for engaging with non-members and some of these, for example trust funds managed by third parties such as the UNDP, would not appear to trigger sanctions under Helms-Burton or other restrictive U.S. legislation discussed below. Today, if Cuba were to suddenly apply to rejoin the IMF, Helms-Burton would mandate the U.S. Executive Director to vote in the negative. However, the U.S.’s 17 percent voting share would be insufficient to defeat a resolution that requires only a majority vote. Cuban membership would not, by itself, trigger the Helms-Burton sanctions that relate not to mere membership but to assistance to the Cuban government. But in the face of strong U.S. opposition, and fearing that the U.S. Congress might deny future IFI capital replenishments, other member states and senior management might well shy away from bringing the Cuba case forward to a vote. Realistically, therefore, Cuban engagement with the IFIs must be a three-stage process: (1) technical assistance, perhaps for a prolonged period of time; there are ample precedents for extending technical assistance to non-members, for example through the establishment of third-party trust funds; (2) followed by full membership; (3) followed ultimately by significant financial assistance. To create more receptive political conditions in the United States, Cuban application for membership assumes progress in implementing those initiatives in the May 2011 reform guidelines that promote wider opportunities for the private sector and more of a market orientation. Formal application for membership also assumes a successful period of mutual confidence- building between the IFIs and Cuba. Upon such circumstances, the White House could submit to Congress that it would be strongly in the interests of the United States, and other IFI members, to assist and promote these reforms, as the IFIs have done in so many other country cases, predicated upon accords between the IFIs and Cuban authorities. Moreover, under such favorable circumstances, it could be argued that it would be folly for the U.S. to seek to withhold U.S. financial obligations to the IFIs and undermine the institutions’ governance structure. Especially at a time when strong IFIs are urgently needed to help stabilize a dangerously fragile global economy, the Treasury could declare, the U.S. must bolster, not subvert, the most successful multilateral economic organizations in world history. As one senior congressional staffer quipped, how could the Congress oppose “asking the Cubans to enter the Temples of Communist Doom?” Sound Treasury arguments would be “untouchable,” she felt, among most members of Congress. With adequate political will, it should not be difficult for the State Department to find valid reasons, perhaps in coordination with the Cuban government (such as its expulsion or extradition of one or more of the alleged terrorists), to remove Cuba from the terrorism list. Similarly, legislation against trafficking in persons (22 U.S.C. Sec. 7107), whereby Cuba has recently been designated by President Obama as an offender despite the Cuban governments’ many actions against prostitution, allows for a presidential national interest waiver. These three mandates (on terrorism, expropriation, and trafficking in persons) do not directly address U.S. votes on a membership application. When legislation mandates the U.S. to oppose IFI loans, as happens with other countries, such as China and Venezuela, who are designated as being in noncompliance with one or more such mandates, the U.S. may vote “no” or abstain but without evident effect as the loans generally garner the necessary majority support within the IFI executive boards. These three mandates, interpreted more objectively (in the cases of terrorism and trafficking) and taking advantage of presidential waivers, do not bind the hands of an executive branch seeking to unshackle relations between the IFIs and Cuba. For the United States, the various restrictive congressional mandates allow the Executive Branch more flexibility than is generally understood. And negative postures by U.S. executive directors in their respective IFI boards, as legislation currently requires under certain circumstances, would most likely not prevail, should issues regarding Cuba rise to a vote. To avert such potential conflicts, the White House should initiate a review of congressional mandates that condition U.S. policies toward Cuban engagement with the IFIs, with the aim of allowing a more flexible U.S. response to Cuban economic reforms and any Cuban expressions of interest in working with the international financial institutions. 1. For an earlier version, see Richard E. Feinberg, Reaching Out: Cuba’s New Economy and the International Response (Washington, D.C.: Brookings Institution, 2011), section 4. 2. For the classic work on IMF membership, see Joseph Gold, Membership and Nonmembership in the International Monetary Fund (Washington, DC: IMF, 1974). 7. Margaret Garritsen De Vries, The International Monetary Fund, 1972–1978: Cooperation on Trial (Washington, DC: IMF, 1985), Vol. 3, p.323. 8. Author interview with an IMF official involved in the Tuvalu membership process. Washington, DC, 2011. 9. James M. Boughton to the author, e-mail correspondence, May 15, 2011. See his Silent Revolution: The International Monetary Fund 1979–1989 (Washington, DC: IMF, 2001). The IMF Articles and By-laws and Rules and Regulations are available on the IMF web site at www.imf.org. 10. The other members that withdrew were Poland (1950), Czechoslovakia (1954), and Indonesia (1965). 12. Similarly, Cuba had been an original member of the World Bank but had never borrowed from it. The decision by revolutionary Cuba to withdraw from the World Bank was received on 14 November, 1960 and became effective immediately. The Bank returned Cuba’s capital subscription, clearing all accounts. “Cuba Withdraws from Membership,” Joint Press Release by International Finance Corporation and World Bank, 15 November 1960. As cited in Daniel P. Erikson, “Can Cuba Bridge the Gap? : IMF and World Bank Membership for Socialist Countries,” in Shahid Javed Burki and Daniel P. Erikson (eds. ), Transforming Socialist Economies: Lessons for Cuba and Beyond (New York: Palgrave Macmillan, 2005). 13. Interview with author, June 27, 2011, Havana, Cuba. 14. For example, Rafael Romeu and Andrew M. Wolfe, Recession and Policy Transmission to International Tourism: Does Expanded Travel to Cuba Offset Crisis Spillovers? IMF Working Paper, December, 2010; Gabriel Di Bella and Andy Wolfe, “Cuba: Economic Growth and International Linkages—Challenges for Measurement and Vulnerabilities in a Bimonetary Economy,” in Cuba in Transition—Volume 19, Proceedings of the Association for the Study of the Cuban Economy, ASCE, Miami, 2009); and Rafael Romeu, “Inferring Quarterly Real Gross Domestic Product Growth in Cuba During the Global Financial Crisis,” in Rafael Romeu et al., The Cuban Economy: Recent Trends (Washington, DC: Woodrow Wilson International Center for Scholars, 2011), pp. 7–29; Ernesto Hernández-Catá, The Fall and Recovery of the Cuban Economy in the 1990s: Mirage or Reality? IMF Working Paper, International Monetary Fund, December 2000. Table 1. 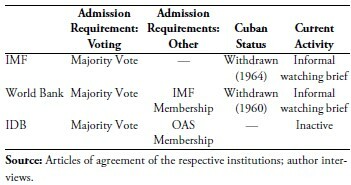 Membership in the IFIs: The Cuba Case Admission Requirement: Voting Admission Requirements: Other Cuban Status Current Activity IMF Majority Vote — Withdrawn (1964) Informal watching brief World Bank Majority Vote IMF Membership Withdrawn (1960) Informal watching brief IDB Majority Vote OAS Membership — Inactive Source: Articles of agreement of the respective institutions; author interviews. 15. Rafael Romeu and Andrew M. Wolfe, op.cit. 17. In the early days of the revolution, the Cuban government looked to well-known, sympathetic economists of the era for advice, but eventually the Soviet Union and its Eastern European allies took over the role of external technical assistance. See José Luis Rodríguez, Notas Sobre Economía Cubana (Havana: Ruth Casa Editorial, 2011). 18. In reflecting on his own experiences in policy making in the early days of the revolution, Che Guevara criticized this nationalist tendency: “We did not consider statistics or other historical experiences, rather we behaved subjectively … and disdained the experiences of other countries.” In “Contra el burocratismo,” Economía y Desarrollo, No. 7, Havana, 1971, as quoted in José Luis Rodríguez, op. cit., p. 76. 19. See James M. Boughton, Tearing Down Walls: The International Monetary Fund 1990–1999 (Washington, D.C.: IMF, 2012), esp. chapter 2. Also, according to Boughton, in 1998, the IMF executive board formally agreed to initiate technical assistance to North Korea and Fund staff had made arrangements to conduct a one-week workshop in Beijing for North Korean officials, to explain about the IMF in more detail. In principle that workshop was to be followed later by a longer training course in economics. But just as the IMF staff was completing the arrangements for the workshop, the North Korean authorities requested that it be postponed. The IMF decision to proceed was taken despite abstention by the US executive director. 20. IMF press release 11/145, April 20, 2011. 22. IMF staff visit to Kosovo. November 5–13, 2003. 23. See World Bank, “Interim Strategy Note for the Republic of Kosovo for the Period FY10–FY11.” Report No. 49872–XK. 24. World Bank. Kosovo-World Bank Partnership, 1999–2009. 25. The Articles of Agreement of the Inter-American Development Bank contain identical language. 26. “Assistance to Non-Members.” Memorandum from the General Counsel to the Bank President, February 5, 1990. 28. CARTAC’s estimated budget for 2011–2015 is a substantial $62.2 million and is funded with external contributions. Canada has been the major contributor. Other international contributors have been the European Commission, the UK Department of International Development (DFID), the Caribbean Development Bank, and the Inter-American Development Bank (IDB). Source: IMF, Caribbean Regional Technical Assistance Center (CARTAC), Program Document, Annex VII: “Expanded Budget by Section,” December 2010, p.113. CAPTAC-DR in Guatemala is supported by the European Commission, Spain, Canada, Mexico, Germany, the Central American Bank for Economic Integration, and the Inter-American Development Bank. Source: IMF, Annual Report 2010, p.36. 29. IDB senior official, e-mail communication with the author, May 20, 2011. 30. Resolution VI, adopted on January 31, 1962, at the Eighth Meeting of Consultation of Ministers of Foreign Affairs. 31. OAS General Assembly, “Resolution on Cuba,” 39th regular session, Resolution 2438, San Pedro Sula, Honduras. June 3, 2009. 32. Andean Development Corporation, Annual Report 2010. 34. U.S. Department of State, Office of the Coordinator for Counterterrorism, Country Reports on Terrorism 2010, August 2011. 35. Their respective ambassadors to Cuba, in conversations with President Jimmy Carter, March 2011, Havana. I am indebted to Robert Pastor, who accompanied Carter, for this information. Richard Feinberg is professor of international political economy at the Graduate School of International Relations and Pacific Studies, University of California, San Diego. Feinberg served as special assistant to President Clinton and senior director of the National Security Council’s Office of Inter-American Affairs. He has held positions on the State Department's policy planning staff and worked as an international economist in the U.S. Treasury Department's Office of International Affairs.